Thanks for coming back. 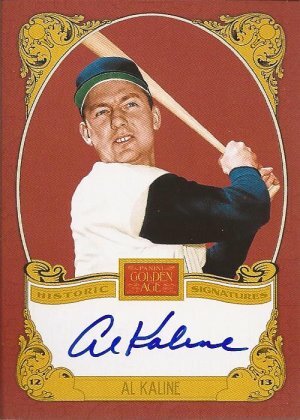 Yesterday I talked about the amazing vintage I scored at the National this past Saturday. Today, let's look at the hits. 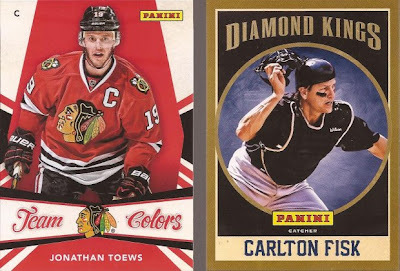 Besides the vintage and about 40 set builders, the rest of my purchases were a couple serialed cards, a box of Panini Golden Age and then the giveaways for said box, and one giveaway from Topps. I think, considering, I did okay. Well, you be the judge. For starters, Topps gave away National exclusives for ripping packs at their booth. There were 8 total cards, and I only cared about one. So three packs of series 2 netted me that card. It's the Thomas you see on the right. 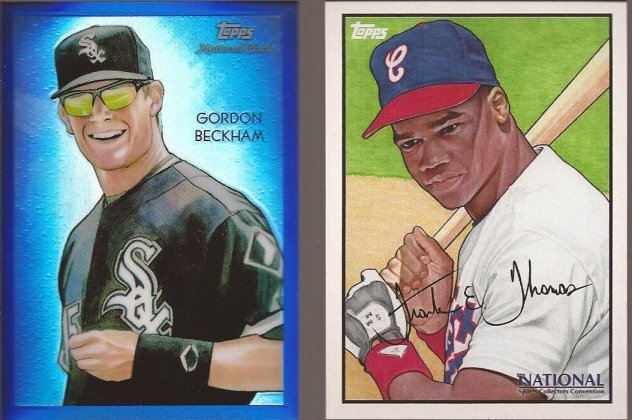 On the left, that's a Beckham card, refractor #130/199. 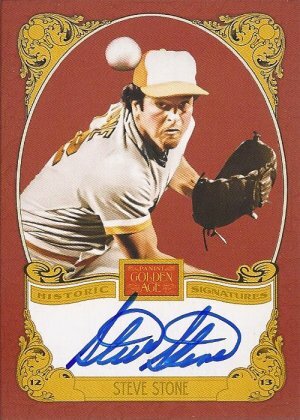 For those that have been a while here, it's the same card as the auto I wanted, mentioned in this post. Don't even fricking start with me, Vicki. Anyway, the refractor was the cost of a paper Washington. I like unique cards, and have wanted to pick up one of these stamp cards from Leaf for a while. Swatch of Fisk along with a nice 3 cent stamp. I paid 5 bucks for this. It came in a nice, heavy screw down holder. So really, I paid just 3 Washington's for a Fisk relic. I mentioned I bought one box for $60. With Panini, if you ripped the box at their booth, you received 4 exclusive packs - two cards in each. Here are the only two local boys I pulled. No complaints. 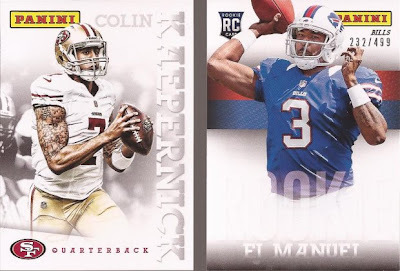 I pulled a serieled EJ Manuel, whomever he is. Plus that douche Kapernick. Is it just me, or is his whole "bicep kissing" a full on jag move? Where's Butkus or Ditka when you need them? End your love affair with your arms real quick, buddy. 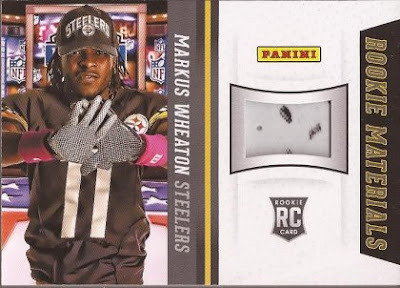 I did get one hit in my redemption packs. Piece of a glove from some 3rd round draft pick. Basically, if it's football, I am open to trade it away. You know how to find me. Last to feature is the box of Golden Age. I really like this product. Yes, it is basically A&G without the logos for the ball players. However, the card stock is nice and the selection of personnel is sweet. 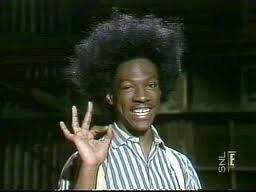 Jockeys, movie stars, TV stars, golfers...heck - I pulled a Buckwheat rookie card. I say, ol' chap...that is quite the prodigious acquisition. 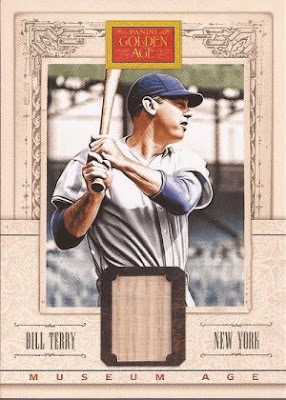 A Bill Terry bat. NY Giants Hall of Famer. BOOM! And I am sorry, Tiger readers - this card is not available for trade. Alright - two posts down. Tomorrow, I ramble about the sights. I have a picture or two to share. That Bill Terry bat card is amazing! 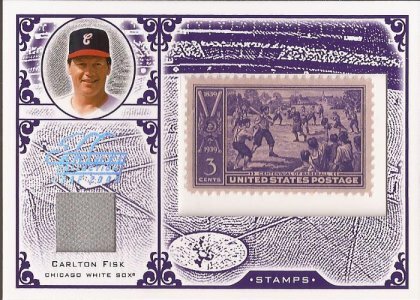 Personally, I like the Stone, but bat cards of Hall-of-Famers don't appear everyday. The Terry is cool... for a Giant. I'm gonna have to go after the Jake Daubert, myself. EJ Manuel might be the starter this year in Buffalo as a rookie. He has an injured Kevin Kolb ahead of him. I has been a Rogue's Gallery since Jim Kelly, with Doug Flutie being the only one I have any consistent positive memories of.